Russian Blues become attached to family members, but can be shy with strangers. They don’t like changes in their routine or environment, and prefer a very clean litter box. They are generally quiet and easily trainable. Russian Blues are generally wary of strangers, and will hide when company comes over. This breed is fussy about its litter box, and wants it kept very clean. If the box is dirty, a Russian Blue may decide to eliminate elsewhere. Russian Blues can be very independent. The Russian Blue are not believed to be related to other short-coated blue breeds, like the Korat, Chartreux or the British Shorthair. 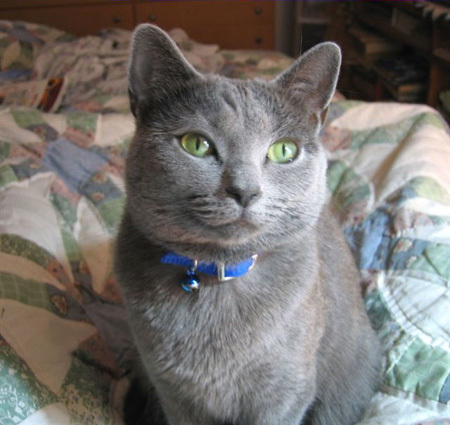 The history of the Russian Blue is shrouded in mystery. Some believe the breed originated on the Archangel Isles in Northern Russia, and was brought to Europe by sailors in the 1800s. 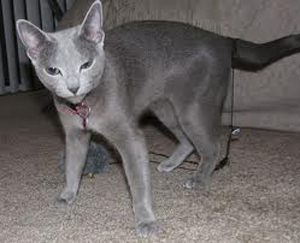 Legend states that the Russian Blue is a descendant of the royal cats owned by the Russian Czars. 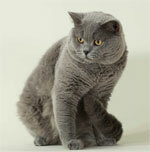 Originally called the Archangel Cat, the Russian Blue was first show in 1875 in England. It was first shown in its own class in 1912. In the early 1900s, the breed was imported into the United States. 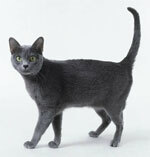 The Russian Blue was nearly lost during World War II as breeding came to a near stop. An attempt to save the breed started in the 1940s as breeders from different countries used other breeds to boost the waning gene pool. 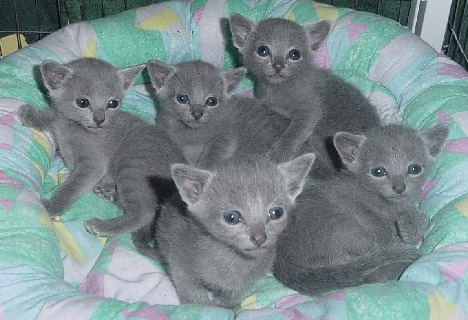 In the 1960s, a group of British breeders united to restore the Russian Blue to its original appearance, and worked to breed out the characteristics that resulted from these cross breedings. 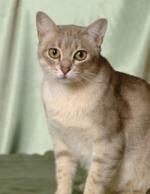 The breed was eventually recognized in the U.S. by the Cat Fanciers Association (CFA), The International Cat Association (TICA) and the American Cat Fancier’s Association (AFCA). 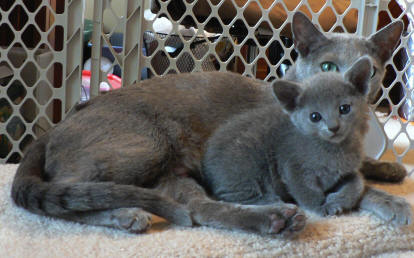 Russian Blues are famous for their plush blue coat, which is uniform in color from one cat to another. The coat has a silvery sheen, the result of silver tipping on the hair. The breed has large, round green eyes and a cobra-like face. The head is wedge shaped, and the ears are large and pointed. 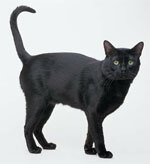 The body is lean and fine-boned, although firmly muscled, giving the cat an elegant look.